File photo The 2015 Scioto County Relay for Life will take place Friday, June 26, beginning at 6 p.m., at Christ’s Community Church. 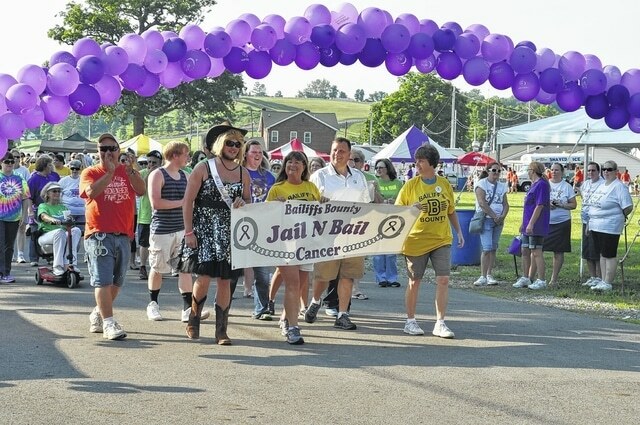 Pictured is the 2013 Scioto County Relay for Life. The Scioto County Relay For Life will be hosting a celebration of 30 years in the fight against cancer. The local celebration will be held Friday, June 26, from from 2 p.m. until midnight at Christ’s Community Church, 2205 25th Street in Portsmouth. LaChona Ferguson, community manager for Relay For Life, said they desire to see eradicate the disease of cancer. “This year we are celebrating the 30 year anniversary for Relay For Life and celebrating hope for a world without cancer. We invite the community to come out to Christ’s Community Church, 2205 25th Street in Portsmouth from 2 p.m. until midnight to help us celebrate the survivors, remember those lost and to continue to support those still fighting,” Ferguson said. By in large, and for the most part, most people have been affected by cancer she said. The schedule of events for the celebration for Friday, June 26, begins at 6 p.m. with the Opening Ceremony, with the Star Spangled Banner to be sung by Andy McGinnis, Color Guard (Ventuers For a Cure), Survivor Lap and Balloon Release, Caregiver Lap in Memory of Lap with Rubyville Church Youth Choir and Balloon Release, Team Lap. At 6:30 p.m. will be the Survivor’s Dinner, Jacalyn Rowland, survivor speaker, survivor stage, Andy McGinnis, singer, survivor stage. At 6:45 p.m. is the Looney Lap – Purple Bra Lap, The crazier the better! Guys join in too. At 7:15 p.m. is singer Casey Redmond on the main stage. At 7:45 p.m. is singer/speaker Abby Wright on the Survivor Stage, and Miss Relay Pageant Introduction, Looney Lap – Marga-Relay-Ville/Parrot Head Lap, Island shirts and grass skirts. At 8 p.m. is singer Bobby Blanton on the main stage, auction with Don Rachford, auctioneer indoor auction location. At 8:45 p.m. is the Looney Lap – Diaaper Lap, – Who’s the biggest babies at Relay? At 9 p.m. will be the Luminary Ceremony, followed by the Miss Relay Pageant winner crowning at 9:30 p.m., and then at 9:45 p.m. is the Looney Lap – Thrift Shop Lap, Model your craziest thrift shop finds. At 10 p.m. Doc Roc and the Remedies, a community favorite, takes the main stage. At 10:45 p.m. is the Looney Lap – Super Hero Lap, grab a cape and help defeat our nemesis, Cancer. At 11 p.m. is Karaoke (time- permitting) on the main stage. At 11:45 p.m. is the Looney Lap – Team Spirit Lap, That’s a wrap! Bring out your team spirit one more time. At midnight is the closing Fight Back Ceremony.